Gorgeos private mountain villa in gated community with waterfalls and hiking. Our tranquil home is ideal for honeymooners, couples getaway and adventurers with exotic bamboos, flowers, fruit trees, herbs, coffee and gardens to stroll and sit in while gazing out upon the mountain vistas, where you breathe, do yoga, think, read and relax. Your bedrooms and bathroom are separate from our quarters for your privacy. You have your own California Kitchen, a BBQ area, living spaces and staff help. If it rains very hard, the outdoor kitchen does get damp but we have options for you in heavy rain. Incredible waterfalls are a short 20 minute walk from the house, town is a 10 minute drive. We live in the exclusive Quintas del Bosque gated mountain development. You have spacious quarters with a Californian kitchen, living spaces and large decks. Our home was built with 4 elements in mind - adventure, imagination, love and nature. 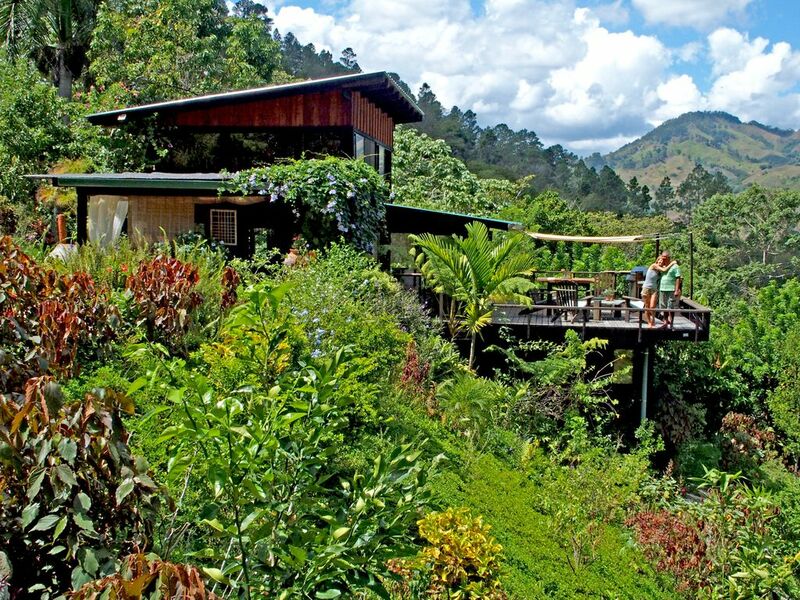 "Casa del Fuego" will surround you with lush gardens – filled with exotic bamboo, flowers, fruit trees, herbs, coffee and gardens to stroll and sit in while gazing out upon the mountain vistas. With total privacy, you can enter from the back stairs through the newly built California kitchen. This is a fully stocked outdoor kitchen with hot and cold running water, gas stove top, small fridge, gas BBQ grill and all the utensils, pots and dishes to cook with. Just bring your food. It is undercover and cool with the breeze. Next to it are two benches to lounge about and a dining table for four people. The two bedrooms and your bathroom are on the same level. The master bedroom has a queen bed and a massage table in a spacious room. The second guestroom has twin bunk beds. If you need to totally disconnect from TV, loud music and constant technology, then this is the place for you as none is offered. We are within a secured gated mountain development, lush with trees and beauty. This is a break from the hustle and bustle of an over-stimulated world, where you breathe, think, read and relax. Town is a 10 minute drive. This property is NOT suitable for young children as there are steep slopes, walkways and decks with little or no railings. Besides enjoying the gardens, you can walk around the estate following the roads. In the spring we have flocks of parrots. Summer is filled with hummingbird by day and fireflies at night. Air conditioning is not needed. When it's hot there is always a spot to be in the shade or go down to the stream or wander over to the waterfalls. The bedrooms stay cool. Winter day time temperature is perfect and in the evenings a long sleeve is all you may need. If you love to write, enjoy painting and sketching, play a musical instrument, this is the place to be inspired. Bring your yoga mat and find your perfect spot to meditate. You will have the feeling of being in the mountains. Across the valley you can barely see the other houses. You have total privacy. We built a natural earthen structure with a live roof that can be used as a sweat lodge/sauna, massage/mediation space or reading room that guests can experience. Jacques is around on the grounds based on what hours you want, so if you need anything, call for him. He you to bring up to the house when you first arrive. Neal Petersen is a solo around the word racing yachtsman, award-winning author of "Journey of a Hope Merchant", subject of a PBS special titled "No Barriers", a keynote inspirational speaker and entrepreneur. Neal and Darlene had this home built as an escape from their hectic travel schedule and global work. Neal began developing the gardens even before building the home. Neal is originally from South Africa but has lived in Europe and America when not roaming the oceans of the world, or working with world leaders as a change agent. While Darlene grew up in Upstate New York, she too has been a wanderer. They met in Charleston, SC where they have another home also available for rent. Much of their year is either spent traveling, at one of their homes or on their yacht in the Caribbean Sea. We fell in love with the mountain and land immediately on seeing the development and bought straight away. While I developed the gardens, Darlene has put her creative touches on the interior to make this a home. We have a small stream to our west, a bigger stream to our north that runs all year round. Over 300 stone steps takes you through the gardens to seating areas, under the tropical canopy, among the bamboos. Our heart and soul is invested here to create a sanctuary of peace and tranquility. Humming birds and butterflies by day, fire flies illuminating at night, with the sounds of parrots sometimes visiting the gardens. It is the sounds of nature, with the smells of heaven in a perfect climate of not too hot and never too cold. When we tire of wondering the globe, this is where we hang our hats, roll up our sleeves and rejuvenate. It is the best area in the island and a great place to base out of to explore the culture, beauty and people. 45 minutes from Santiago airport (STI), 10 min drive to Jarabacoa, yet a world away from the hustle. You can land by helicopter near the house. The views from the decks are stunning looking across the mountains, see the sunset, feel the cooling summer breeze, enjoy stimulating conversations on global subjects, or just relax reading a book. This property is ideally suited for nature lovers and couples wanting time to rejuvenate. In addition to Neal and Darlene being here to help you feel at home and explore the area, is Jacques who has worked for the family for over 5 years tending the gardens, maintaining the house and helping guests with anything needed. Your own bathroom off the bedrooms. Walk in shower, plenty of room to put toiletries, extra towels. Very spacious area. We have many fireplaces starting with the large wood fired BBQ outside, or cook with us in the pizza oven in the grotto. An outdoor California kitchen with everything you will need. Just bring your food and drinks and come play. We have lots of dining spots. Your main dining table is under the cover by the California kitchen. Snack in the grotto or garden seating. We have extensive gardens with exotic bamboos, fruit trees, coffee grove & lots of shrubs & flowers. There are two stone benches, one being down at the gurgling stream. Lots of walk ways in gardens. NO formal pool. Hike out to the waterfalls & swim in natural pools. The first pool is 20 min hike, or the bigger pool is a another 50 min beyond. Regular pool at the River Club day rental 5 min drive. We live in the mountains so lots of hiking to waterfalls on the property or in the area. You can go white water rafting, horse riding even paragliding. Close by is a delightful spa. On the next door estate is a restaurant with spectacular views and a revolving floor on weekends. We do not have internet nor television as this a place ideal for a couples retreat, yoga many places to sit and read, or watch the garden grow and humming birds dart around. There are several fun drives in the mountains too. My stay was short but memorable! This is a magical place, a pleasant retreat from the real world. When we first arrived we walked around in the gardens taking in all the natural beauty, the property itself fits perfectly into the environment and has everything you could possibly need to enjoy a relaxing stay. The outdoor kitchen is fully equipped with quality items. The bedrooms were clean and comfortable, bathroom is nice and there are thoughtful details all around. The caregiver for the property, Jacques, is friendly and very respectful. He assited when asked and was around if we needed him. He took us on a hike to the waterfalls and that was the highlight of the trip. The owner was reaponsive, attentive and provided all the needed information. The property is in a gated community, however it still feels remote and isolated, completely private. I would love to visit again, just perfect! Views and plant life are gorgeous! The property is on a ridge overlooking a landscaped hill with many beautiful plants and butterflies. Lots of nice fluffy white towels. There are a number of things people should know: the communal pool that is listed under amenities, is not accessible to guests of this property. There is a cat on premises. The toilet had daily flushing problems (having nothing to do with what was in the toilet)- apparently a chronic issue, per the owner. Hot water in the shower was intermittent - you'd have it for 1-2 minutes, then it would be cold. If you can tough out the cold, the hot eventually comes back, again for 1-2 minutes. The bedrooms do not have any closets or any way to hang clothes. The California kitchen is workable but not really a cooks kitchen. You'll want to keep food prep simple. The fridge is quite small. The stove a bit crowded for the size of the pans. We took the hike to the waterfalls and loved it but note that we are 2 very fit and agile adults. It might be a tough hike if you have any mobility issues or balance problems. We had a 3 day stay and I was glad it was not longer. Entre l'océan Atlantique et la mer des Caraïbes, proche de JARABACOA, l'endroit est idéal pour une étape vivifiante au cœur de la montagne Dominicaine. Le chalet est blotti dans un magnifique jardin tropical ou il fait bon flâner et découvrir les différentes essences d'arbres et fleurs qui offrent une harmonie de couleurs, d'odeurs...végétation tropicale que l'on apprécie, également, en prenant un verre sur la terrasse du chalet dominant la vallée. L'accueil de NEAL et de sa compagne est chaleureux et leurs conseils pour découvrir la région sont précieux...en résumé un endroit recommandé pour une étape en REPUBLIQUE DOMINICAINE. You and your friends were wonderful guests. The best actually. Really enjoyed having you and you are welcome back anytime. Happy travels. Die Unterkunft ist wie auf den Fotos zu sehen. Allerdings sind die Fotos von der großen Terrasse und dem lichtdurchflutetem Wohnraum nicht von der Ferienunterkunft sondern private Räume des Vermieters. Wir waren leider zur Regenzeit da, wo es recht kühl und nass war. Außer der offenen zugigen Küche gab es keinen trockenen Aufenthaltsort außer den Betten. Zum Glück waren die Vermieter gleichzeitig da und haben uns mal zu sich nach oben eingeladen, wo wir uns aufwärmen konnten. Selbige sind super nett und aufgeschlossen und versuchen alle Wünsche zu erfüllen. Dann gibt es noch Jacques, die gute Seele des Hauses. Er kümmert sich unaufdringlich um die tägliche Lehrung der Mülleimer, tauscht Handtücher und Bettzeug aus und versucht alle Sonderwünsche zu erfüllen und Fragen zu beantworten. Er steht auch für Ausflüge und andere Hilfsleistungen zur Verfügung (Einkaufen, Essengehen), was besonders für des Spanischen unkundige Gäste von großem Vorteil ist. Wir haben uns trotz nächtlicher Kälte sehr wohl gefühlt. Fazit: außer in der regenreichen Zeit Dezember/Januar, wo man eben auch mal Pech haben kann, ist die Unterkunft als Ausgangspunkt für Wanderungen und Erkundungen der Bergregion super gut geeignet.